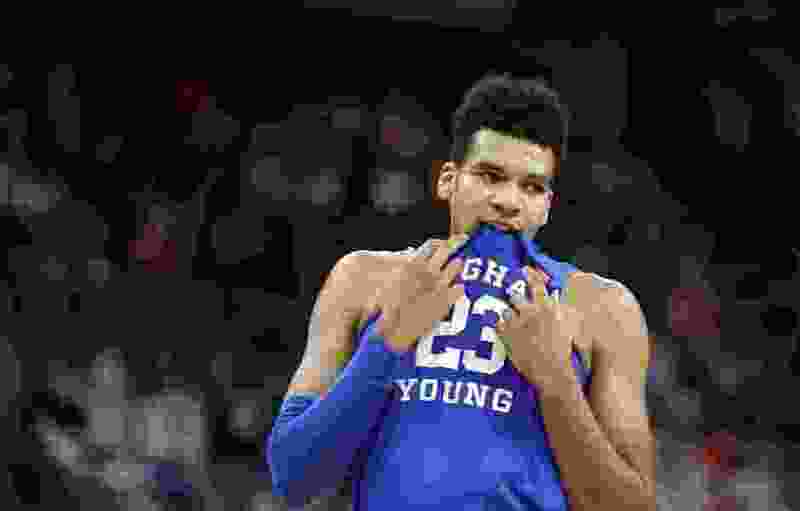 San Francisco • Yoeli Childs hit a 3-pointer a little more than seven minutes into Saturday’s college basketball contest at San Francisco to give BYU a two-point lead, and the Cougars appeared ready to challenge the supposed second-best team in the West Coast Conference. But that was as good as it got for the visitors, who went the next 7 minutes and 9 seconds without scoring. Meanwhile, the Dons played as well as advertised at sold-out War Memorial Gymnasium (5,300), and stomped the Cougars 82-63, the first time USF has ever defeated BYU at home in eight tries. Trailing 43-29 at halftime, BYU put together some decent stretches the first half of the second half and cut the deficit to six. But San Francisco recovered quickly, improving to 4-1 in WCC play, 16-3 overall. Childs, who made 9 of 21 shots, put the blame squarely on his own shoulders. BYU fell to 4-2 in WCC play, 12-9 overall, and returns to Provo to host Saint Mary’s on Thursday. It is USF’s best start since it opened the 1981-82 season with a 16-2 record. The Dons are 10-1 at home, the only loss coming last Saturday against No. 5 Gonzaga. TJ Haws chipped in 12. No other Cougar reached double figures as Rose again searched for a reliable third scoring option. Freshman Gavin Baxter, who scored 13 points off the bench in Thursday’s big win at Pepperdine, was held to two points in 16 minutes. USF’s Jamaree Bouyea, who entered the game with a 5.4 scoring average, poured in a career-high 15 points and Frankie Ferrari led the Dons with 21 as fans chanted MVP after he made shots in the second half. The league is billing USF, with its No. 40 standing in the NET rankings, as a potential NCAA tournament at-large candidate, and it certainly looked the part. Of course, the Cougars helped. The Dons got four easy layups/dunks before the first media timeout, which was only a sign of things to come. They shot 65 percent in the first half, including 5 of 9 from 3-point range, and finished shooting 64 percent. The Cougars shot just 44 percent. Childs’ triple gave BYU a 15-13 lead with 12:30 remaining in the first half. Then San Francisco went on a 16-0 run — the Cougars had 13 empty possessions in the futility streak — and that was that. Rylan Bergersen’s free throw broke the drought and the Cougars recovered offensively the rest of the half. But their defense failed them, much like it has all season when things are going poorly on offense. San Francisco stretched its big lead to 39-21, with senior post Matt McCarthy scoring easy baskets inside on four straight trips down the floor, before Haws scored eight straight to stem the tide. Unfortunately for the Cougars, they still had to play the second half at a building where they were 7-0 before Saturday’s collapse. Childs took over briefly to start the second half, and McKay Cannon’s triple cut the deficit to nine. Cannon finished with nine. But after a quick timeout, Ferrari sank his second 3-pointer and Bouyea picked Haws’ pocket for an easy basket, and the Cougars were backpedaling again. Cannon’s third 3-pointer and a Haws bucket cut USF’s lead to 53-47 with 13 minutes remaining, but USF answered with a 12-1 run to regain control. The Dons led by as many as 21 in the final five minutes. “If we come out and make some layups, it is probably a lot different game,” said Childs. Stopping easy layups on the other end would have helped, too. • Frankie Ferrari scores 21 points and USF beats BYU at home for the first time ever. • Yoeli Childs leads BYU with 25 points and TJ Haws adds 12, but no other Cougar reaches double figures. • BYU drops to 4-2 in WCC play, 12-9 overall.